A few things you should know about the Deer Park Fire & Public Safety. It’s around 1 PM on March 19th, 2019 at the time of this writing, and from the museum district we can all see a billowing cloud rising from the east. As we all know, this is due to the chemical plant fire that occurred last Sunday in Deer Park. Some of you may have questions about the potential repercussions of this disaster that the cursory information presented on the nightly news cannot answer. Others of you may have heard rumors of potential health risks. This article is intended to help you better understand the situation and also provide a guide you can reference in any future events like this. Let’s get the credentials out of the way real quick. Before my current position here at the museum I worked on the U.S. Army Bomb Squad for roughly five years. While most of my experience dealt with ordnance and explosives handling, quite a lot of our focus was in chemical hazards (From military agents to industrial TICS and TIMS). My entire job was reliant on hazard mitigation and doing exhaustive research into any situation we were asked to respond to. Some of this information can be useful to the general public, and it’s my intention to share that with you. Next time the headlines come rolling in, feel free to reference this article to gauge your response, or maybe just find some peace in the critical information you may need to stay healthy and informed out there. We’re going to use Naphtha (Link to the MSDS here) as our focus. I’m also going to pull some more general areas off the data sheet that should give us a quick assessment of what we’re dealing with, and things to look for. Quick note, this is a brief description that is intended to provide general knowledge. There are tools and programs that go into extreme depth about these resources, which are used by professional responders working these incidents. So let’s dive in! First up, let’s check out the NFPA Diamond. 4. Life-threatening, major or permanent damage may result from single or repeated overexposures (e.g., hydrogen cyanide). 3. Major injury likely unless prompt action is taken and medical treatment is given. 2. Temporary or minor injury may occur (e.g., diethyl ether). 1. Irritation or minor reversible injury possible. 0. No significant risk to health. Okay, great! As of now, we can at least determine a quick assumption of health risk, Naphtha being 1. This is no guarantee of absolute safety and can only act as a general indication for the hazards of the chemical. Although the health threat posed by Naphtha is in theory not very severe, in reality substances health risk varies from person to person depending on preexisting respiratory conditions. This is where air quality comes in. Let’s take a moment to get a better idea of how to gauge the air quality in the general public and a couple of concepts we need to interpret these reports. Here is a recent report of the air quality in the surrounding area. 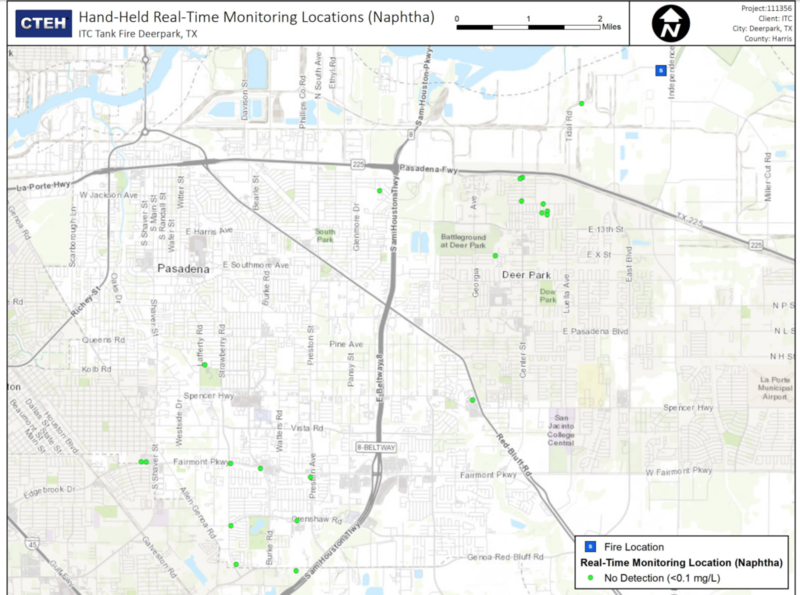 Let’s pull out the image of air monitoring tests for Naphtha in surrounding area and dig into the details a bit more. Air quality report from CTEH. At the beginning of the report you can check for exactly what tool was used to process the air in the indicated points on the map, but we’ll focus on the legend. No detection (<0.1 mg/L). Now that measurement might seem daunting or a bit too scientific, but this concept can often be reported as parts-per-million or PPM (In this case, we’re breaking down the separate compounds in the open air and reporting it by volume.). Since we’re dealing with a fire, our primary concern to the public is likely an inhalation hazard, so think of this as a system of measurement that allows us to get a real-time view of just how much of a given compound is out in the air. Back to our trusty data sheet! Where can we apply this measurement or cross-reference it. Section 8 showing exposure limits by OSHA/ACGIH. Cool. More acronyms that look just as daunting as the data measurement. Think of OSHA and ACGIH as industrial standards when it comes to hazards and safety. If we take a look at the OSHA standard and look at the PEL for Naphtha we can see a reading of 100ppm. PEL stands for personal exposure limit. In the public we can use this as tool to personally compare our own surroundings to what the working standards are in terms of exposure. At those current readings, most civilians should not exhibit symptoms for this one compound. Important note: Uncontrollable variables like wind, temperature, and air pressure can change these reports and readings. We’re also reliant on the recorded data from the geographical point of collection. This can just clue in certain parts of communities that may find themselves downwind of the incident and in the effected area. Now we’ll use the data sheet for one last thing. Health varies from person to person, and there’s no telling what incident could occur in the future. However, we can also use these sheets to help us establish signs and symptoms to look out for if we experience an incident such as this. Let’s take a look at the Notes to physician column. Here are the common symptoms reported from over-exposure to Naphtha. This can also assist those in a community who may be prone to respiratory issues, and also act as a decent indicator for your own personal wellness. I understand that the science or analysis behind hazardous materials isn’t necessarily super interesting, but I do believe in the merits of preparation and knowledge. Safety is a paramount concern for society, and we as a community can utilize these tools to help strengthen our response to whatever incident our city may face. Based on this information we can determine that the health risks from this event will be minimal when speaking directly about breathable air. Any person with pre-existing respiratory problems are also at minimal risk. I’ll leave some general links below for those inclined for a quick bookmark, and thanks for reading. Stay safe out there ya’ll. AirNow’s real-time Air quality map. 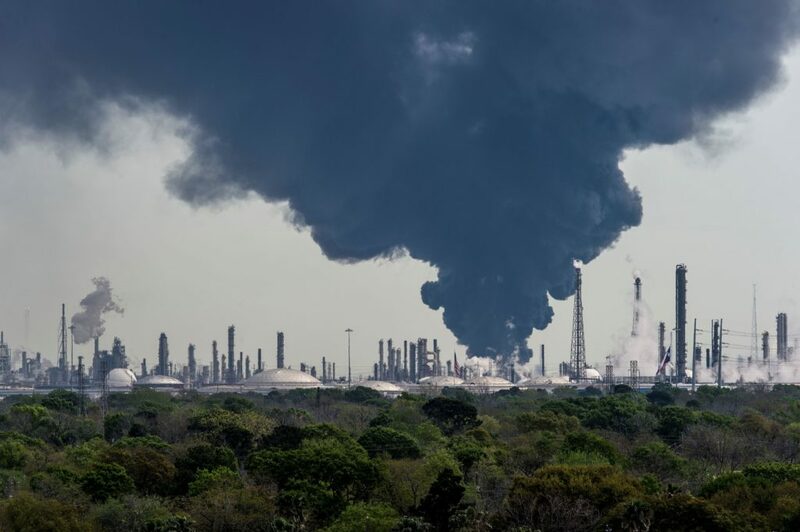 (22 March 2019) – Editor’s Note to readers: One thing I do want to elaborate on is the dangers of exposure to particulate matter and general safety from burning hazards and downwind hazards. There are a lot of great articles coming out about this right now. Will update ASAP to give a more well-rounded take. Previous Post New Leaf Cutter Ant Exhibit at HMNS! Next Post Late Nights At HMNS Are Great Fun For Everyone!